A one stop service with everything you ever needed to know about fruitarianism and more.. Guest Book <- This is Me. A Message to all Animal Lovers.. It's 390 pages, so slightly bigger than Destination Eden … It's not so much a sequel, but more of a complimentary book, expanding on the ideas expressed within the first book. Also, yesterday, February 2, 2016, saw the official release date of the revised second edition version of Destination Eden. 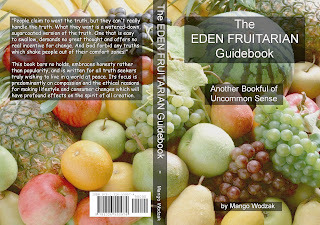 The publishers are asking if anyone who has read the book would care to give a short one or two line review on the Amazon page, www.amazon.com/Destination-Eden-Fruitarianism-Mango-Wodzak/dp/1940184258 (and take a look at the other reviews while doing so!) any support in doing so will be greatly appreciated! A couple of other language translations are in the pipeline… A German version, and also a Spanish version… I will post here when they are both ready; sorry, cannot give a time estimate. Comparative Anatomy of Carnivores, Omnivores, Herbivores, Frugivores and Humans .. 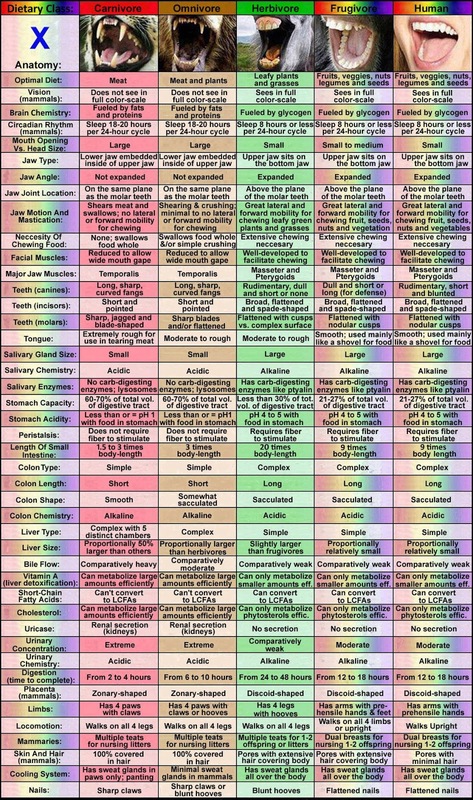 Here's a wonderful chart showing our anatomical / physiological / taxonomical classification as frugivores.. 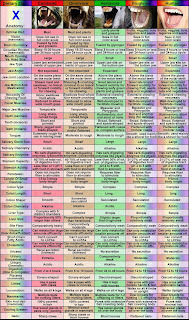 It's a comparative anatomy chart, comparing the carnivores, omnivores, herbivores and frugivores, and it should be abundantly clear that we are neither Lions, nor tigers nor bears, oh my! So all those people screaming balance of nature as justification for eating other animals, please recognise that by choosing to eat the butchered remains of other animals, you are actually upsetting the balance of nature, not aiding it! So far there have been numerous reviews of my fruitarian book (Destination Eden), most of them quite pleasant and positive..
Mango is clearly the Arnold Ehret of the 21st century! This book is a must read for all budding vegans, raw vegans and fruitarians, it explains things in a no nonsense way, and should be on the bookshelf of anyone interested in self improvement and who genuinely cares about their healths the lives of others, and the environment. It goes further than every other raw book I've read so far. I heartily recommend his book, and will surely be ordering several more copies to give away to family and friends. THANK YOU MANGO! Mangodurian, your fruitarian book 'Destination Eden' is sooooo good! 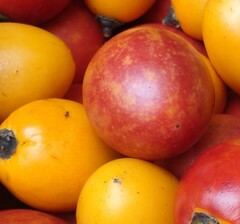 The logic with which you explain things makes being Fruitarian a no brainer! Educates people to take responsibility for themselves and for the world and it's living creatures. Love love love it! Peace x....I'm half way through. Mango, I finished your book some days ago and I love it. You did really well. And I am totally with you on the pet issue - my grandma used to say they don't belong in the house and should live wildly and freely. And great idea for a couple to choose their last name, I love it. Our beautiful blue planet is raging with wars, terror, famines, sickness, sadness etc. There is a solution to this problem – understood only by a few, ridiculed by many. A starting point for us is to realize first of all – we as humans need to consider how we conduct ourselves on our planet. We need to go back to basics - paradise in its whole - from where we have originated. Have you ever thought about how society has conditioned the human race, in civilizing behavior, customs, values, etc. Have you ever thought who you were created to be, before you were told how to live life and what you should think, who would you be when you were left out in the wilderness? The other day I stumbled upon a blog of someone who said it quite nicely, re-wild yourself, what would that mean for us today? 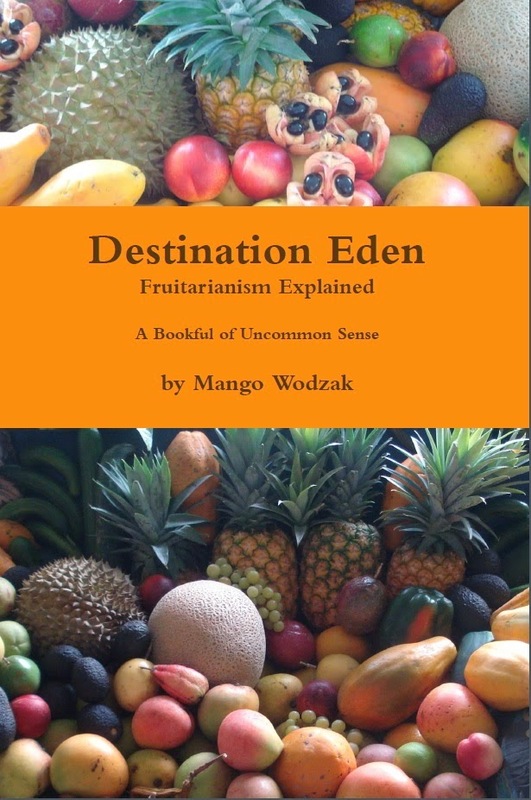 Mango Wodzak presents in his book a view on true fruitarian philosophy – “Destination Eden: Fruitarianism” Explained sheds some light on the subject of human life on earth and is by far one of the most eye opening reads of the century. Fruitarian philosophy does not only mean living on a fruit based diet, but also encompass faith, ethics, proper stewardship of our planet as instructed to us back in the Garden of Eden, ethics towards people inhabiting the planet, as well as all other living beings / things on the planet. Lastly by living in this holistic balanced view, we can enjoy health as a result – provided by the foods from Paradise. Fruitarian Philosophy is a peace revolution for our earth, in paving the road back to paradise. Yes! Really good book! Everyone should read it a couple of times! And i am so glad that Mangodurian Elfrugivoro wrote it! I feel that i am not the only one thinking like this. I love life, i love living, i love peolpe, the earth, The Energy! Eating fruit and having less negative impact as possible with my use of everything. I want to take/use/recieve and give it back in a egual or higher vibration. Contribute to Paradise of Energy! you have an absolute talent for writing, this is not just a book.. In my honest opinion you writing style should be honoured and placed amongst the best in the world. I have ready many books in my life..
A suggestion and if you ever have time, if you would write a fantasy story book for adults / children, something similar to Lord of the rings etc. I believe you will sell thousands of copies. You could make it about a fantasy fruit paradise and evil beings trying to kill all the animals and destroy the earth etc. I love your book for 2 reasons. 2. Because it turned me on to Withnail and I.
I've passed it on to my wife and she is reading it with delight and we are discussing daily the wisdom inside. Please let me know if I can help out in any way! Got your book last week. I am really enjoying it so far. I find myself just opening it up to a random page and reading some amazing wisdom. Thank-you for publishing a book that the world sorely needs. Just want you to know I received your beautiful book yesterday. And I am loving it! I've read about half . . . looking forward to the weekend when I can really indulge myself. : ) I will definitely be buying more copies to give as gifts. It is quite thought-provoking on many issues and I do need this challenge in some areas where I am not quite living up to my own beliefs. It's not so easy to break away from conventional thinking and modern society, as much as one wishes they could. It's very inspiring the way you have forged your own path and I look forward to your autobiography which will perhaps shed light on the more personal aspects of your transformation and journey. But for now I am very happy to read your logical conclusions and hopes and dreams. Very well done, friend! You can be proud of this creation! Many thanks for sharing your thoughts and wisdom!!! I am grateful you are here. The world needs you. ? Mango hat nach 13 Jahren sein Buch namens "Destination Eden" herausgebracht! Endlich, möchte ich sagen, denn es ist wirklich ganz anders als alles, was ich bisher zu dem Thema gelesen habe. Zuerst mal: Es geht kaum um's Essen. Dafür um vieles andere, von Barfußlaufen bis zu Politik. Mich hat es begeistert und an vielen Stellen zum Nachdenken angeregt. Mango ist einfach ein wirklicher Freigeist. Ich kann nicht an allen Stellen folgen, aber das muss man ja auch nicht. Hier kann man das Buch in Papierversion oder als Pdf bestellen. Translation: After 13 years, mango has published his book "destination Eden"! I have to say "finally" as it is really very different to everything else I've read so far on the subject. Firstly, it's not really about food, but about many other things, from being barefoot, to politics. I was fascinated by it, and much of it really made me stop and think. Mango's a real free spirit. I can't follow his every step, but there is no obligation to either. "Destination Eden is clearly one of the true spiritual-ethical books everyone needs to read in order to awaken and understand what our true biological diet and lifestyle needs are. If we are to survive as a species and co-exist with other beings, we need to understand that "Eden Fruitarian", as Mango Wodzak coined, is what we need to embrace in our lives if we want to create a world of peace and love. No longer can we argue against the fact, that eating food from the Garden of Eden is what our bodies' are biologically designed for. A highly recommended book for everyone." Mango I have read most of your book and am reluctant to say I agree with most of it, and can't really fault it. However, the truths you tell are not easy for me to swallow. mango i am nearly throuh. what a read. your book has been one of the most important books in my life. thank you. Really great book. I really appreciate it, it brings me more than I could ever think! I love the way it's make (with sticky notes), the simplicity and modesty of your writing. I say Buy it if you want a vision that can change the world. Buy it if you want a new moral that can change your own person. Buy it if you want a transformation. The transformation come from your inside, but inspiration can help. This book is inspiration. Finally I want to say that I've been inspired with some of your ideas that I never heard before like: you green team on biggest loosers (haha , youre right! ), if the humans become a morals species we could inspire carnivore animal the change, the calendar so much simpler, or how if the axis of our planet became more neutral there would be less changes in the season. What an eye opener your book has been! I just finished reading it, and was most impressed. It made me think about so many things I'd never before thought of. Especially loved your "Vision" section. It all feels so "right". This book is a masterpiece! I must tell you that I enjoyed your book SO MUCH. I intend to reread it soon. I am in agreement with most everything you say . . . and I applaud you for sharing your vision with the world. Your book is a beautiful expression of your intelligence and your awareness. I'm sure it would be mind-blowing to most. It is frustrating to feel that you are one drop of water in an ocean of craziness. So it certainly helps me personally to read such sane and uplifting ideals. I am ready to move to the tropics and get rid of my shoes! Thank you for putting yourself out there. It's not so easy or wonderful in this age of judgement and criticism. One must be brave. Absolutely loved this book! I love the simplicity of it, and fully believe the crux of it that it's love that truly makes the world go around. Many of mangos shared thoughts here are new to me, the plant perception, the benefits barefoot, and balance of nature.. truly eye opening. A definite "must read", serious and at the same time humorous. My fingers are still tingling from reading the pages too! Thanks mango! Just finished reading Mango's book. It's got some excellent quotes in it and really enjoyed reading it. Obviously I don't agree with mango on everything.. calories and that.. But then I don't think I agree with anyone on everything. Great book! Took me 3 days to read it, I just couldn't put it down! Truly inspiring, and loved the little boxes with the great quotes and humor! regarding your proposed plot for a movie about world wide human awakening, unplugging out of the matrix if you will, i think it would be a fantastic movie--what a wonderful plot you thought up, gave me goosebumps reading it. An amazing book written by an amazing man. I don't know why Mango isn't recognized for the greatness he has achieved and why there aren't thousands of people following his every suggestion. While I don't agree with every single thing in it, for example I think aggression can be natural and natural is always good and there's never a problem with something natural, a wonderful and inspiring and wise and genuinely educational (in the original sense of the word) book. I am almost finished with mango's book and I must say this is one of the best books I have ever read, the information in there could change everyone's lives for the better.. I just finished reading Mangodurian Elfrugivoro book "Destination Eden". I believe this book will go down as history along with anne Osborne's book as one of the first true books that describes the optimal diet for man, our original diet, how to achieve optimal health through nutrition, optimal beauty, etc. I must say that of all the raw vegan books out there such as 80/10/10, etc. I have never read a book that actually gets this close to the discussion of Eden Fruitarianism as Mango describes it. If you want to achieve the best health you can, and look the youngest you can for your age, and never have stress or always love, then you must read this book!! Just finished reading Mangodurian's new book, "Destination Eden." It's a great vegan treatise full of Mango's wonderful sense of humor. I especially loved the cartoons! I can honestly say that I really enjoyed it. Although I don't agree with all of Mango's logic, he is a witty writer and it's a good read. I started reading it and so far its everything I was hoping for even better. This was definitely a great purchase and I highly recommend EVERYONE to give it a try... when I read it I get the goosebumps as if this was the word of an alien creator (god)... btw sorry If i sound weird I believe in extraterrestrials and that we are some form of project... I will read some more now of your book Your book makes A LOT of sense. Mango is a modern day fruitarian philosopher who lives a life that defies many conventions, yet arguably is the most natural way of being. Mango and his partner Kveta, both long term fruitarians, enjoy simple, rural life and local tropical fruit from the markets or their own garden. I met Kveta online several years ago, when my interest in fruitarianism was just a little spark, as a member of a forum she created. I feel a special connection with Kveta and Mango. Mango’s book is a long awaited and welcome addition to my library, which I am still reading. It covers many compelling topics and keeps me interested. I like to keep it handy and grab it whenever I feel the need for some uncommon sense and philosophy. This is a unique book that offers a vision to the world that needs it desperately. I feel lucky to read this book during these times of change, right when the new history is being created. 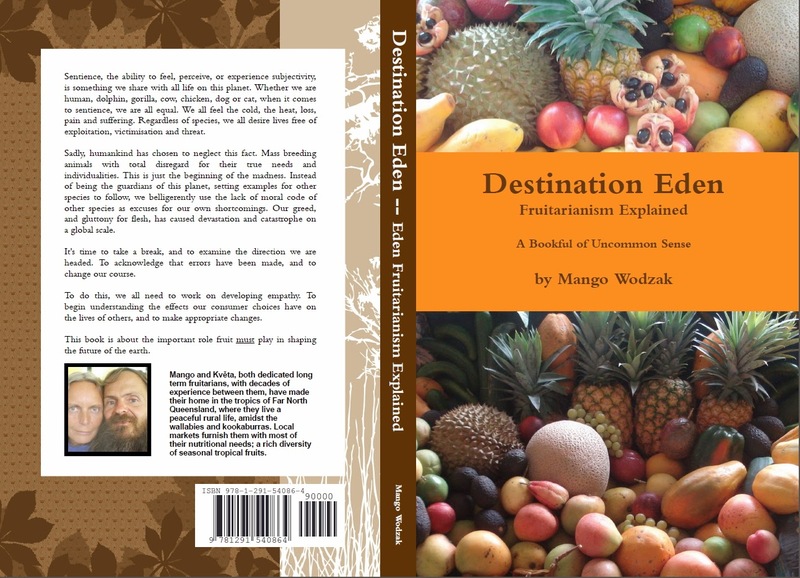 Destination Eden was written by my fruitarian friend Mango and explains his Eden Fruitarianism lifestyle. He created the term "Eden Fruitarianism" to distinguish his lifestyle from the different definitions of fruitarian that currently exist. This book does not provide any scientific evidence or nutritional data to back up his belief that fruit is the best food for our bodies and he explains why he doesn't believe in doing so. What this book does provide is lots of food for thought. Mango bases his beliefs on compassion and shares his thoughts about fruitarianism, animal farming, monocrops, the pet industry, country borders, footwear, our voting system and much, much more. He also interspersed his book with many great quotes. Vegans are often asked "what about plants, don't they feel pain". If nothing else, this book definitely provides "the solution to the screaming carrot dilemma". If you consider yourself to be an open-minded person, who enjoys being challenged by new ideas, then this book is a really good read. It might even inspire you to make some changes to your current lifestyle. Simply loved this book. So much so that I am reading it again from the beginning. Want to make sure I didn't miss anything! A friend of mine lent me this book, I had no real expectations, and to be honest didn't believe I would enjoy reading it, but somehow I got sucked in to it, and each page was an eyeopener for me. It covers more than most books I have read about ethics and lifestyle, and really requires an open mind to follow through to the conclusion it leads to. I am still digesting it, but positively one of the best books I have ever read, and I am so grateful to Jan for sharing it with me... Now to make a nice fruit smoothy! I've read your book. It is a great read! I am 99% fruitarian now and words cannot explain just how good I am feeling. Physically, mentally, emotionally and spiritually. The best thing I have ever done and your book had a lot to do with me doing this, so I am very grateful. I bought it, and love it! will keep going back to read it. I'd recommend it for everyone. I didn't agree with everything in the book but it was still an enjoyable read. I especially liked all the quotes, jokes, cartoons scattered throughout the book. Mango, I didn't like your book. I just didn't like it. Loved your book Mango! Read it from cover to cover. Twice. I think I've read every page of you blog too, and loved that, which is why I got your book. Thank you for all the knowledge you've shared with us, and please please keep writing! If you're interested in fruitarianism, Destination Eden - Fruitarianism Explained is a fantastic read and I highly recommend it. Simply loved Destination Eden. I keep it next to the toilet, and open it up at random to get words of wisdom and encouragement. Can't wait for your promised autobiography - Hurry up with that! This book is truth. Every page. Very enlightening, will get more copies to give as presents, everyone should read it! First of all I want to say that youre a huge inspiration to me. I came across your blog in 2009 and my heart knew you were speaking the truth right away. But kept finding reasons why fruitarianism wasnt for me... I believed that you lost your teeth because of fruit among other things (which obviously isnt the case!) Then came across 801010 which was slightly less of an "extreme" and with all the science backing it up I decided to go from cooked vegan to raw. But eating greens never felt right to me and I had this battle in my head between ethical fruitarianism (heart) and 801010 (mind). Last summer I decided not to follow any guidelines except my own heart and intuition. And I havent had any veggies since. Read your book a couple of weeks after it was released and I agree with virtually everything (still find it hard to accept what you say about pets since I have a dog, wont get any other pets in the future though). Ethical fruitarianism/Eden fruitarianism pretty much sums up my life philosophy and what Im striving for in daily life. Just finished your book and I have to say bravo!! I loved it greatly and your views on some things just opened my eyes further. A truly eye opening book! Everyone should have a copy! I finally got the courage to purchase the book. After reading 3/4 through I suffered from a major bout of overwhelm. It lasted a full weekend and hit me so hard I wondered whether I would ever pick up your book again. I spent time in my garden totally avoiding the issues that raced through my overactive mind. But by Monday evening I felt a surge of peace - with my failures, my wasted years, my situation. So I finished your book. And I now thank you. It rates with only two other books that have shaped, challenged and pushed me to new heights. Congratulations and well done. Mango, I first discovered your book at a local market earlier this year. I picked it up and flicked through it, but didn't buy it.. Then some weeks ago, I came across it again, and decided it was obviously something I needed to read and I am so glad I did. I absolutely loved it!! It answered so many questions for me, and opened my eyes to so many things on so many levels. I agree with other reviews I've seen of your book, this is the best one I have ever read, and I know I will keep coming back to it and rereading it. Thank you so much for writing this and I hope you write more because I think your message is unique and concise and one the world needs to hear. Thankyou thankyou. the best $28 I ever spent!! I just finished your book--it was excellent; thank you, so very much. Mango, what a brilliant idea for a TV series, I would definitely watch that one! Loved the rest of the book too. I feel I am only just getting started and your book is a guiding light for me. Thanks! I am almost done reading this book. I have never in my life read a book that put all my thoughts and feelings down in writing. It's almost shocking and a blessing to know there is another human out there that feels this way. Thank you Mango. This is now my bible. I now don't feel so isolated and alone in this world, and possibly I don't have to make such an effort to hide my thoughts as so to have people think I'm crazy. This is a must read for everybody. I am honored to be an Eden Fruitarian. Waiting on your next book. Thank you for being such a kind and gentle creature Mango. I loved this book. A very good read. I was very happy reading your book and the humour within. I found your book incredibly challenging but difficult to fault, even your views on pet keeping were especially hard for me as I have 3 dogs and a cat. I cried out no no no! but I have to admit there is as you say an uncommon sense to your opinion, that is really making me think. thanks for sharing your wisdom and insight! Awesome book! Read it twice now, cannot wait for the next one! it has taken me 13 years!! I need a break from the keyboard. I know, I know.. I don't blog anymore. it's true. The rest of my life takes up too much time. However, I'm just here to say a few quick words about a potential new fruit centered documentary that will be made should there be enough funding. You all surely recall the "pure fruit" documentary of Kveta and I? Well, Emile, the director, and David, the camera guy, may team together once more to film the woodstock fruit festival this year. Although their focus is more on fitness, their undue preoccupation with calories and the 801010 philosophy, the festival nevertheless promotes a predominantly fruit diet, and will hopefully encourage others to consider a moving toward true fruitarianism. The Fruitarian documentary featuring myself and Kveta is finally finished and available to watch for free for one week, online. Emile (the director) has created a facebook page called "Pure Fruit", with more details. I have stopped blogging. Not sure if it's a temporary thing or more semi permanent.. In any case, Kveta and I are both doing well, and enjoying living in our new home which fulfils many/most of our dreams. We hope to spend the rest of our days here surrounded by fruit trees. I hope to one day continue writing my book, and let all the story be known. But for the moment, the garden is our priority, together with enjoying life and sunshine.